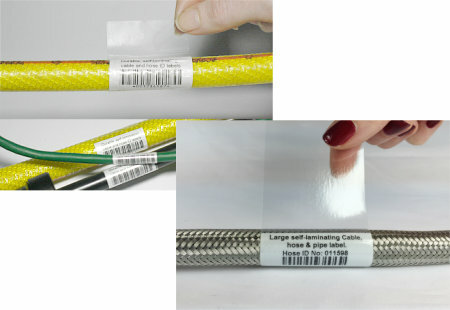 Print durable self-laminating cable, hose and pipe ID labels in-house and on demand, or let us supply the labels fully printed, with your variable data to include your logo if required. Simply design and print your data onto the white printable area, using a laser or thermal transfer printer. Then apply the white printed section to your product and then wrap the durable clear, tail around the printed portion and the product, sealing in the data and protecting it against hazardous conditions.